Let's start with some basic code. This tutorial is written on top of my 2d opengl basecode, but the code should be easy enough to follow even if you're not planning to use the library. Since this isn't too exciting, let's define our particle class. The x and y are the current x and y position, xi and yi represent the motion vector, and 'life' is a counter which says how long the particle will be alive. If 'alive' is zero, we won't render it. That's the plan anyway. 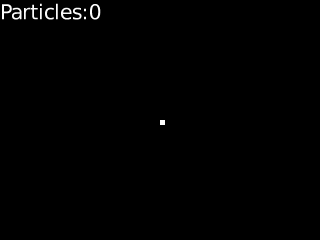 In our "physics" code, we'll go through the particle array and move all of the particles that are still alive. We reduce the life by one; don't worry about that yet. Now, this still isn't too exciting, so let's add gravity. The physics block gets modified like this: (the 0.025 value is just something I figured out experimentally. Your mileage may vary). And we'll add a new function that spawns a single particle. Here's a little trick that I've used; instead of making sure all particles we ask for exist, just pick a random slot in the array, and if it's unused, fill it. We're spawning so many particles that missing a few doesn't really matter. You could, instead of this, keep a linked list of particles or search for the first free slot, but both of those have performance overheads, and just having an array of particles will keep the particle count in a sane range. Of course the negative side (when compared to linked lists) is that you still have to scan the whole particle array, but I think it's a good tradeoff. I'm naturally just using particles for the visual effect; if your particles have some actual effect, like causing damage or some such, you probably care more. Now, if your particles live forever, you're going to run out sooner or later. That's what the life counter is for. We've barely scratched the surface so far, but you can see how things can move from here. Lots and lots of things can be done with the physics, depending on what you want to do with the particles. For smoke, a common trick is to use randomly rotating rectangles. For fun explosions, you may wish to use several different particlesystems in one place: fire, smoke, shrapnel, etc. Nothing says all particles should start from a single point; you can easily make line, square, cubic etc. emitters. The particles themselves can be anything; the most fun particle systems I've seen used animated butterfly meshes! And naturally particles can be particle emitters themselves.